With Pipeliner CRM version 11.0, we are demonstrating absolute continuity in optimizing the application, and in streamlining and supercharging sales activities throughout the world. We took the name, as we have been doing for the last several years, from an ancient work—in this case the Law of Continuity. The Law of Continuity is a principle introduced by German mathematician and philosopher Gottfried Leibniz in 1701, and is the principle that “whatever succeeds for the finite, also succeeds for the infinite. Pipeliner CRM Continuity is focused primarily on sales activity management features—some of which can be found in no other CRM application. Activity 1:N allows you to attach the same activity to one or more accounts, contacts, leads or opportunities—anywhere it applies. Ability to report on the “difference” value—the difference between the list price and the actual sale price. Ability to define product or service value in multiple currencies. Ability to assign products to a dedicated pipeline. Example: Perhaps you have a product pipeline and a services pipeline, each sold by a different sales team. These could be assigned to separate pipelines as needed. Parent Sales Unit—Ability to add parent sales unit to reports as column, or filter data according to parent sales unit. You can now bulk export leads and opportunities directly into an Excel spreadsheet. Previously, you had to create an opportunity report in order to export opportunities to an Excel spreadsheet, but now they can be exported directly. Ability to copy an opportunity to a different pipeline. Compact View for Leads and Opportunities is now enriched with contacts, accounts, and notes (previously it was only tasks and activities). 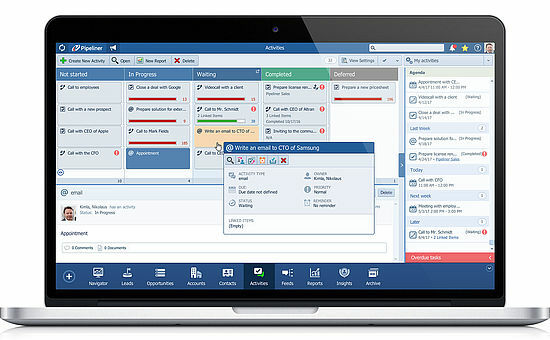 A version of the Pipeliner’s powerful Navigator feature has now been added to Pipeliner Mobile CRM.